Anthrax letters were most likely on the evening of October 8. Monday, October 8, was (A legal holiday commemorating the discovery of America by Christopher Columbus) Columbus Day, hence no mail pickup. "My friends call me Victor". I understand the concept of genetic polymorphism. I suggest you read the article before you pontificate about this. I refer you, in particular, to Figures 1 and 2, and the accompanying legends." "What if the anthrax were engineered to be resistant to certain antibiotics. Is there a chance "piggy backing" antibiotics would offer a better chance. I purchased Lawrence Joyce's How to Survive a Germ Warfare Attack over the web shortly after 9/11. Doxy could be effective against a resistant bacteria. resistance to the new like Cipro and Doxy as it is to penicillin or ampicillan. and the misspelling: antiobiotics - remind you of anything? I do it routinely in the lab. You can do it with it a kit that costs about $500." (which I will ignore here). labs (B, C and D). markers were all on plasmids. The 1997 goat substrain represents an outgroup vis--vis the USDA anthrax. came from Porton Down, it came from a different culture than the one examined by the scientists. genotype of the original, canonical, USDA Ames. And that's all you can say, based on the genotyping evidence." with finding someone other than Saddam to pin this on. " Copyright © 1991 John Wiley & Sons, Inc.
is prepared by electrostatically depositing alternating layers of colloidal silica and cationic polymer onto macroscopic nickel core particles. The polymer is then burned out and the silica partially sintered to yield a porous shell with 5-80 m2/g of surface area. This magnetic composite was tested as a support for immobilizing invertase. Sucrose was continuously converted to its component monosaccharides with nearly constant activity over the first 8 days and retention of 50% of initial activity after 25 days. Dr. Kenneth I. Berns, president of the Mount Sinai Medical Center in New York City, said he judged the probability that Iraq possessed weaponized smallpox as "reasonably high" and that Saddam Hussein would use such germs in a war against the United States as "quite high." "Oh dear. Better hope he doesn't have anything genetically-engineered to evade the vaccine. I use genetically-engineered viruses in my work, and it is rather frightening how easy it is with current technology to play mix and match with these things. For instance, it is quite routine to take an ecotrophic virus (one that only infects a single species) and turn into an amphitrophic virus (one that infects a wide range of species) simply by swapping out the genes that code for the coat proteins. If Saddam is operating at that level of technology, I venture to say we could lose about a third of the population in the coming showdown -- comparable to a full-scale nuclear exchange. If he has only conventional smallpox, anthrax, botulism, etc., then we may be able to contain the threat to something managable by building up our civil defense infrastucture. Even then, I don't think we're near that point -- perhaps in a couple of years. I expect Bush to keep up the rhetorical heat on Saddam and pursue every avenue to put the squeeze on him, including military pressure, but I thing those who are expecting a big assault in the next 12 months will be disappointed. Way too dangerous, I'm afraid." FBI investigators and federal scientists have been secretly working for months to replicate the type of anthrax used in last year's deadly mail attacks, as part of a previously undisclosed strategy designed to determine precisely how the spores were manufactured, officials said yesterday. FBI Director Robert S. Mueller III, who revealed the experiments in remarks to reporters here, said that using such "reverse engineering" could help investigators narrow the list of possible suspects. "We're replicating the way or ways it might be manufactured, but it is not an easy task," Mueller said. "We are going into new territory in some areas." "They'd probably want to look at several methods of doing it -- try to make it several different ways to reproduce the end result," said David Franz, head of the Chemical and Biological Defense Division of the Southern Research Institute and former commander of the the U.S. Army Medical Research Institute for Infectious Diseases (USAMRIID), the nation's principal biodefense research center. "It doesn't seem like an unreasonable idea." Plant cell culture using a novel bioreactor: the magnetically stabilized fluidized bed. Bramble JL, Graves DJ, Brodelius P.
Department of Chemical Engineering, University of Pennsylvania, Philadelphia 19104. A novel bioreactor using magnetically stabilized fluidized bed (MSFB) technology has been developed that has certain advantages for cultivating cells continuously. In this system, the cells are protected from shear and are constrained to move through the fermenter in lock-step fashion by being immobilized in calcium alginate beads. The MSFB permits good mass transfer, minimizes particle collisions, and allows for the production of cells while maintaining a controlled cell residence time. Details of the experimental system are described. In addition, the experimental performance of an MSFB used to grow plant cells in batch mode is compared to the results obtained in shake flask culture. Professor David Graves received his undergraduate education at Carnegie Mellon University and his SM and ScD degrees from MIT. His research since then has centered on the application of chemical engineering principles to biotechnology and medically related problems. This has included separation and cell growth systems with magnetically stabilized beds, non-uniform field electrophoresis, immobilized enzyme reaction systems, artificial photosynthesis, affinity chromatography, cell adhesion to surfaces, plant cell culture systems, and most recently analysis and optimization of DNA microarray processes. Professor Graves has consulted for numerous industrial, governmental and legal organizations. He has supervised 17 PhD students and 10 undergraduate and masters thesis students. He has lectured widely and authored over 100 articles, plus 10 patents. His honors include a Fulbright award as well as a Humboldt Foundation fellowship and "Quest for Technology" prize from the Wharton School. His sabbaticals have taken him to Germany and Sweden, and most recently to Stanford University to work with others on microarrays. Hey you friggin' weirdo, listen up and listen carefully: the guy that you keep insanely thinking is the anthrax murderer and that you nuttily believe is going to inevitably be arrested by the FBI sooner or later doesn't work at Merck, his name isn't Victor Goetz, and he doesn't live anywhere in or near New Jersey. He a biology grad student at Caltech named Luigi Warren. Please stop repeatedly trolling this site under different names and personalities if you don't mind, thanks. ANTHRAX POWDER - STATE OF THE ART? When the anthrax mailers penned the message, "YOU CAN NOT STOP US. WE HAVE THIS ANTHRAX," the threat included a chilling nuance that remains largely unrecognized. "ARE YOU AFRAID?" asked the attackers. "Yes," should have been the answer, according to some biodefense experts, who think that the anthrax spores mailed to Senators Thomas Daschle (D-- SD) and Patrick Leahy (D--VT) in the fall of 2001 represented the state of the art in bioweapons refinement, revealing telltale clues about the source. This view is controversial, however, because others dispute the sophistication of the Senate powder, and a schism now exists among scientists who analyzed it for the FBI. One group, comprised mostly of microbiologists and molecular biologists, argues that this material could have been a do-it-yourself job, made by someone knowledgeable but with run-of-the-mill lab equipment on a modest budget. This contingent includes one well-known bioweaponeer, Ken Alibek, who defected from Russia to the United States in 1992. The other faction thinks that the powder mailed to the Senate (widely reported to be more refined than the one mailed to the TV networks in New York) was a diabolical advance in biological weapons technology. This diverse group includes scientists who specialize in biodefense for the Pentagon and other federal agencies, private-sector scientists who make small particles for use in pharmaceutical powders, and an electronics researcher, chemist Stuart Jacobsen of Texas. Early in the investigation, the FBI appeared to endorse the latter view: that only a sophisticated lab could have produced the material used in the Senate attack. This was the consensus among biodefense specialists working for the government and the military. In May 2002, 16 of these scientists and physicians published a paper in the Journal of the American Medical Association, describing the Senate anthrax powder as "weapons-grade" and exceptional: "high spore concentration, uniform particle size, low electrostatic charge, treated to reduce clumping" (JAMA, 1 May 2002, p. 2237). Donald A. Henderson, former assistant secretary for the Office of Public Health Preparedness at the Department of Health and Human Services, expressed an almost grudging respect: "It just didn't have to be that good" to be lethal, he told Science. As the investigation dragged on, however, its focus shifted. In a key disclosure, U. S. Attorney General John Ashcroft revealed in August 2002 that Justice Department officials had fixed on one of 30 so-called "per sons of interest": Steven J. Hatfill, a doctor and virologist who in 1997 conducted research with the Ebola virus at the U. S. Army Medical Research Institute of Infectious Diseases in Fort Detrick, Maryland. (Hatfill has denied any involvement in the anthrax mailing.) Although the FBI did not spell out its theory, this announcement and leaks to the media from federal investigators indicated that the inquiry had embraced the idea that a lone operator or small group with limited resources could have produced the Senate anthrax powder. This premise now appears to have run its course. In September 2003, the FBI's Michael Mason admitted that the bureau failed to reverse engineer a world-class anthrax powder like the Senate material and expressed regret that Hatfill had been called a "person of interest." One of the costliest manhunts ever conducted by federal investigators appears to be stymied. The FBI cannot or will not say whether the anthrax powder was foreign or domestic, expensively made or cheaply done, a professional job or the handiwork of an amateur. But the scientific data amassed so far should provide a wealth of information on the weapon's possible origins, say scientists in the group with expertise in such powders. They argue that the most striking qualities of the Senate powder do not concern the anthrax spores but the way they were processed-- specifically, how they were given an electrostatic charge and unusual surface properties. If the Senate anthrax powder did in fact have these refinements, its manufacture required a unique combination of factors: a strain that originated in the United States, arcane knowledge, and specialized facilities for production and containment. And this raises the discomforting possibility that the powder was made in America, perhaps with the resources of the U.S. government. There is no debating that the Senate powder was exceptionally pure and highly concentrated. Nor is there any doubt that it contained the Ames strain, one of the most virulent strains discovered. But what made it truly remarkable, according to biodefense specialists, was its conversion into a cutting-edge aerosol. That transformation had as much to do with chemistry and physics as with microbiology. Anthrax spores cling to one another if they get too close; sticky chains of proteins and sugar molecules on their surfaces latch onto each other, drawn by van der Waals forces that operate at a distance of a few tens of angstroms. Untreated spores clump into larger particles that are too heavy to stay airborne or reach the narrowest passages in the lung. To thwart this clumping, an earlier generation of biological weapons makers--operating out of Fort Detrick when it still made weapons--experimented with ways to prevent the surfaces of germs from getting too close. For example, William C. Patrick III, former chief of Fort Detrick's Product Development Division, pioneered the use of a dusty silica powder with nanometer-sized particles added to nonlethal incapacitating agents such as Francisella tularensis, the cause of tularemia (but not Bacillus anthracis, the cause of anthrax). "Otherwise," says Patrick, the powder was "very hard to disseminate." In a separate research arena, pharmaceutical scientists in the 1990s began experimenting with adding electrostatic charges to small particles in medicinal powders designed for inhalation. Adding a like charge of sufficient strength creates an electrostatic field of up to a few centimeters, which makes particles repel one another, creating an "energetic" or self-dispersing powder. Biodefense scientists say they became aware that such an innovation could be ap plied to germ-warfare powders with deadly effect, especially deadly because charged particles are more prone to lodge in the lung. Once in the lung, immune cells transport the spores to lymph nodes, where the spores germinate and cause infection. The Senate anthrax spores carried like electrical charges, and some experts believe that they were added deliberately to aid dispersal. Was it a coincidence that this lethal innovation appeared in the anthrax spores sent to the Senate? Alibek thinks it is possible. The Senate anthrax could have acquired a charge from friction as the envelopes passed through mail-sorting machines. (Alibek also has speculated that the powders mailed to the Senate were more refined than those sent to the New York media and may have come from a different production run.) But his theory raises a question: Why would only the Senate powder acquire a charge from the sorting machines? Jacobsen, a research chemist who coated sub--5-micrometer particles with silica while working on a program for the Defense Advanced Research Projects Agency (DARYA), is skeptical of this idea. Jacobsen says that friction would add static electricity only to surfaces: "If anything, the sorting machine's pinch rollers and the envelopes should get charged," he says, "not the spores inside." More revealing than the electrostatic charge, some experts say, was a technique used to anchor silica nano-particles to the surface of spores. About a year and a half ago, a laboratory analyzing the Senate anthrax spores for the FBI reported the discovery of what appeared to be a chemical additive that improved the bond between the silica and the spores. U. S. intelligence officers informed foreign biodefense officials that this additive was "polymerized glass." The officials who received this briefing-- biowarfare specialists who work for the governments of two NATO countries-- said they had never heard of polymerized glass before. This was not surprising. "Coupling agents" such as polymerized glass are not part of the usual tool kit of scientists and engineers making powders designed for human inhalation. Also known as "sol gel" or "spin-on-glass," polymerized glass is "a silane or siloxane compound that's been dissolved in an alcohol- based solvent like ethanol," says Jacobsen. It leaves a thin glassy coating that helps bind the silica to particle surfaces. Silica has been a staple in professionally engineered germ warfare powders for decades. (The Soviet Union added to its powders resin and a silica dust called Aerosil&#8211;a formulation requiring high heat to create nanoparticles, says Alibek. U. S. labs have tested an Aerosil variant called Cab-O-Sil, and declassified U. S. intelligence reports state that Iraq's chemical and biological warfare labs imported tons of both Cab-O-Sil and Aerosil, also known as "solid smoke," in the 1980s). "If there's polymerized glass [in the Senate samples], it really narrows the field [of possible suspects]," says Jacobsen, who has been following the anthrax investigations keenly. "Polymerized glasses are exotic materials, and nanotechnology is something you just don't do in your basement." By March 2002, federal investigators had lab results indicating that the Senate anthrax spores were treated with polymerized glass, and stories began to appear in the media. CNN reported an "unusual coating" on the spores, and Newsweek referred to a "chemical compound" that was "unknown to experts who have worked in the field for years." When Science asked the FBI about the presence of polymerized glass in the Senate powder, an FBI spokesperson said the bureau "could not comment on an ongoing investigation." By the fall of 2002, the awe-inspiring anthrax of the previous spring had morphed into something decidedly less fearsome. According to sources on Capitol Hill, FBI scientists now reported that there was "no additive" in the Senate anthrax at all. Alibek said he examined electron micrographs of the anthrax spores sent to Senator Daschle and saw no silica. "But I couldn't be absolutely sure," Alibek says, "because I only saw three to five of these electron micrographs." Even the astonishingly uniform particle size of 1.5 to 3 micrometers, mentioned in 2001 by Senator Bill Frist (R-- TN), now included whopping 100-micrometer agglomerates, according to the new FBI description recounted by Capitol Hill aides. The reversal was so extreme that the former chief biological weapons inspector for the United Nations Special Commission, Richard Spertzel, found it hard to accept. "No silica, big particles, manual milling," he says: "That's what they're saying now, and that radically contradicts everything we were told during the first year of this investigation." Military scientists did not back off their findings. The August/ October 2002 newsletter from the Armed Forces Institute of Pathology (AFIP) reported that a mass spectrometry analysis found silica in the powder sent to Senator Daschle (The AFIP Letter, August/ October 2002, p. 6). "This was a key component," said the institute's deputy director, Florabel Mullick, in the AFIP newsletter. "Silica prevents the anthrax from aggregating, making it easier to aerosolize," she added. Frank Johnson, chief of AFIP's Chemical Pathology Division, corroborated this in an interview. "There was silica there," said Johnson, "there was no mistaking it." Maj. Gen. John S. Parker, commander of the U. S. Army Medical Research and Materiel Command at the time of the attacks, says he saw AFIP's lab reports. "There was a huge silicon spike" consistent with the presence of silica, he says. "It peaked near the top of the screen." Other agencies support this view today. For example, John Cicmanec, a scientist with the U. S. Environmental Protection Agency, says the Department of Homeland Security confirmed to EPA that the perpetrators did, in fact, use silica to weaponize the Senate anthrax spores. According to an abstract that Cicmanec will present at the annual meeting of the Society for Risk Analysis next month, this weaponized form of anthrax is more than 500 times more lethal than untreated spores. The contradictory military data compelled the FBI to do some explaining. Sources on Capitol Hill say that in an FBI background briefing given in late 2002, Dwight Adams, one of the FBI's top- ranking scientists, suggested that the silica discovered in the Senate anthrax was, in fact, silicon that occurred naturally in the organism's subsurface spore coats. To support his thesis, Adams cited a 1980 paper published by the Journal of Bacteriology-- a paper that Matthew Meselson, a molecular biologist at Harvard University, says he sent to the FBI. The authors reported that they found silicon, the element, in the spore coats of a bacterium called B. cereus, a close cousin of anthrax. In the 23 years since the Journal of Bacteriology published these data, however, no other laboratory has published a report on significant amounts of silicon in the B. cereus spore coat, and many bacteriologists familiar with these data consider them an anomaly. Even the authors suggested the finding might have been due to "contamination." 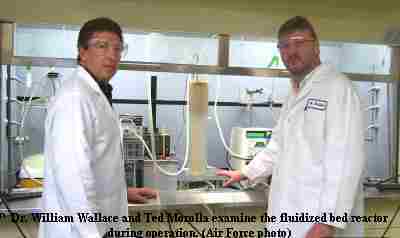 Military sources say that Dugway washed and centrifuged the material four times to create a pure spore preparation, then dried it by solvent extraction and azeotropic distillation-- a process developed by the U. S. Chemical Corps at Fort Detrick in the late 1950s. It is not a simple method, but someone familiar with it might be able to jury-rig a lab to get the job done. As recently as 1996, Bill Patrick says he taught scientists at Dugway how to do this. The FBI-Dugway effort produced a coarse powder. The spores--some dried under an infrared lamp and the others air-dried--stuck together in little cakes, according to military sources, and then were sieved through "a fine steel mesh." The resulting powder was placed into test tubes. When FBI officials arrived at Dugway to examine the results, a Dugway scientist shook one of the tubes. Unlike the electrostatically charged Senate anthrax spores that floated freely, the Dugway spores fell to the bottom of the test tube and stayed there. "That tells you the particles were too big," says Spertzel. "It confirms what I've been saying all along: To make a good powder, you need an additive." One doesn't have to look very far to find a powder that more closely resembles the Senate anthrax. The U. S. Army's newest batch of anthrax simulant is a closer match, made with B. globigii (BG) spores, which are similar to anthrax but nonlethal. According to military sources, the Danish company Chris- Hansen spray-dried the spores (along with an unidentified "additive") in Valby, a suburb of Copenhagen. Although the spore count varied somewhat from batch to batch, Chris-Hansen says that the average concentration was 500 billion spores per gram, about 100 times more concentrated than the Army's old BG powder. Chris-Hansen shipped the bulk material from Denmark to its New Berlin, Wisconsin, facility in 1996, where, according to Army instructions, it mixed silica into the powder-- a product sold commercially under the name Sipernat D 13. Sipernat D 13 is made by Germany's Degussa AG, the same company that makes Aerosil. The initial Chris-Hansen production run wasn't exactly what the Army wanted, military sources say, so this batch of anthrax simulant was further enhanced at Dugway Proving Ground. An official at Chris- Hansen, speaking on condition of anonymity, says he doesn't know if the Army added an electrostatic charge or a coupling agent to the powder, and the Army won't discuss it. But unlike the powder that Dugway reverse engineered earlier this year, the most recent batch of simulant-- according to military sources-- has great "hang time." A government scientist who had a sample of the Army's anthrax simulant described it for Science: When he shook a test tube filled with it, a dense fog of particles swirled to the top in roiling eddies. After 10 minutes, the powder still hadn't settled. This scientist observed two other marked similarities with the Senate material: "There appears to be a lot of static charge," he said. When he suspended the preparation in water, he saw mostly "single spores." When Canadian military scientists used this silica- laced simulant in 2001 to assess the risk from anthrax spores delivered by letter, the aerosol behaved like the one that would later contaminate Senator Daschle's office with real anthrax spores; the weaponized BG particles spread across a 50-cubic-meter room in less than 2 minutes. This new batch of "energetic" simulant was light-years beyond the old U. S. weapon in its refinement, experts say. Divulging the specifications of the weapon, the last foreman in charge of drying and milling anthrax spores at Fort Detrick, Donald Schattenberg, told Science that the old U. S. anthrax powder contained no additives. "We didn't use silica or bentonite" (a clay that contains a high percentage of fine- particulate silica), says Schattenberg. "We made little freeze-dried pellets of anthrax," he says, "then we ground them down with a high-speed colloid mill." The resulting powder contained growth media residue (called "menstruum") and vegetative cells, making it less concentrated, according to William P. Walter, who says he worked on every batch of anthrax spores ever produced at Fort Detrick. This extraneous material accounted for a significant amount of the powder's volume and mass. Orley Bourland, who once managed the entire operation, says the old weapon had no electrostatic charge and contained only 20 billion to 30 billion spores per gram. These facts were corroborated by more than half a dozen veterans of the former U. S. weapons program, including Edgar "Bud" Larson, who scoffs at the suggestion that the Senate powder was the product of a secret one-man operation. "I think that's very unlikely," Larson said. "I don't think anyone could make this product covertly." So far, only Dugway Proving Ground has acknowledged making aerosols with Ames strain spores. According to a memorandum from U. S. Army Test and Evaluation Command dated 19 July 1995, Dugway began experiments with a liquid preparation of the Ames strain starting in February 1994. This was part of what the Army called "bioprofiling": an effort to "establish a 'library' of information," said the memo, to help defend against biological attack. In December 2001, The Baltimore Sun broke the story that Dugway had been making dried anthrax using live spores, and The Washington Post reported that Dugway used the Ames strain in its anthrax powders. Dugway released a statement acknowledging that its scientists have been doing this work to develop an "effective bioaerosol collection" but insisted that "All anthrax used at Dugway has been accounted for." The Battelle Memorial Institute, a non-profit organization based in Columbus, Ohio, is possibly the only corporation in the world known to possess both the Ames strain as well as a "national security division" offering the services of a team of "engineers, chemists, microbiologists, and aerosol scientists supported by state-of-the-art laboratories to conduct research in the fields of bioaerosol science and technology." On its Web site, Battelle calls this research group "one-of-a-kind." As subcontractors, Battelle scientists have made anthrax powders for use by the Army and U. S. intelligence agencies, but rarely by Fort Detrick, which specializes in vaccine development. Charles Dasey, spokesperson for the parent agency, the U. S. Army Medical Research and Materiel Command, says that as far as he is aware, the only dried anthrax spores made at Fort Detrick since it stopped making weapons were made by Battelle scientists working there for DARPA. This material, made in a biosafety level 3 suite in the Diagnostic Systems Division, contained killed Ames strain at a concentration of 326 million spores per gramÑÑ several orders of magnitude less concentrated than the Senate powder and crude by current standards. Battelle is capable of more sophisticated work, as it also makes one of the world's most advanced medicinal powders. Battelle's pharmaceutical division, BattellePharma, also in Columbus, is one of the few companies anywhere developing electrostatically charged aerosols for inhalation. BattellePharma's Web site boasts that the company's new "electrohydrodynamic" aerosol "reliably delivers more than 80% of the drug to the lungs in a soft (isokinetic) cloud of uniformly sized particles." Other powders, boasts the Web site, only achieve 20% or less. None of this argues that Battelle or any of its employees made the Senate anthrax powder. But it is evidence that Battelle was a logical place to start looking for clues. Officials from Battelle and the Army declined to comment on any aspect of anthrax powder manufacture. The FBI says it has interviewed and polygraphed scientists working at both Dugway and Battelle. No "person of interest" at either facility has been named, and no evidence has been made public indicating either as a point of origin. Today, there is no firm evidence to link Iraq-- or any other governmentÑÑ to the anthrax attacks. But some weapons experts such as Spertzel are still inclined to look for a sponsor with deep pockets, and they say Hussein's regime cannot be ruled out. Spertzel's main point, however, is that only a state-run facility or a corporation has the resources to make an anthrax powder as good as the one mailed to the Senate. The amateur anthrax scenario appears to have lost some credibility with the failure of the FBI's attempt to reverse engineer a high-quality powder using basic equipment. If the Army couldn't do it in a top-notch laboratory staffed by scientists trained to make anthrax powders, skeptics ask, who could do it in a garage or basement? The silica dust might still provide a trail to the killers, say chemists who specialize in silica. According to military sources, since the abandonment of the offensive biological warfare program, the U. S. Army has continued to experiment with various brands of silica nanoparticles added to germ-warfare powders produced in small quantities. These include WR-50 and WR-51 (manufactured by Philadelphia Quartz Co.), Cab-O-Sil (Cabot Corp.), and Sipernat D 13 (Degussa AG). Each brand is made differently, so each has a unique chemical signature, says Jonathan L. Bass, a Pennsylvania-based analytical chemist who used to do research with silica at PQ Corp. (formerly Philadelphia Quartz). "It'd be a laborious process, and some of the differences would be hard to detect," says Bass, "but if a known brand of silica was used by the killers, I think I could trace it back to a specific company." A coupling agent should also provide a unique chemical signature that could narrow the field. Two years on from the attacks, public discussion of the silica additive has all but ceased; the discussion about polymerized glass has yet to occur. Instead, the FBI has devoted much of its effort to the idea that a low-budget amateur operation could have produced a "weaponized" form of anthrax powder without a sophisticated additive. "ARE YOU AFRAID?" asked our unknown assailants 2 years ago. "Yes," is still the answer, but of whom? Gary Matsumoto, an investigative journalist in New York City, is writing a book on biodefense. A method of, and an apparatus for, conducting chromatographic separations of multi-component systems utilizing silica-coated, magnetically susceptible particles in an MSFB is disclosed. A support material comprised of beads having a magnetic core surrounded by a silica derivative porous coating is used. 2885366 May., 1959 Iler 252/313. 3219318 Nov., 1965 Hershler 259/1. 3439899 Apr., 1969 Hershler 259/1. 3440731 Apr., 1969 Tuthill 34/1. 3485658 Dec., 1969 Iler 117/69. 3505785 Apr., 1970 Kirkland 55/67. 3951799 Apr., 1976 Weiss et al. 210/695. 4016149 Apr., 1977 Travis et al. 210/635. 4115927 Sep., 1978 Rosensweig 34/1. 4247987 Feb., 1981 Coulaloglou et al. 34/1. 4261109 Apr., 1981 Mikus et al. 34/1. 4272893 Jun., 1981 Levenspiel et al. 34/1. 4283204 Aug., 1981 Savage 55/3. 4339337 Jul., 1982 Tricot et al. 210/679. 4411789 Oct., 1983 Liburdy 210/198. 4661327 Apr., 1987 Horton 210/679. 4675113 Jun., 1987 Graves et al. 210/635. 4780113 Oct., 1988 Koslow 210/661. 4855045 Aug., 1989 Reed 210/223. 4861705 Aug., 1989 Margel 210/661. 4919804 Apr., 1990 Dorsey et al. 210/502. 4935147 Jun., 1990 Ullman et al. 210/695. 4937001 Jun., 1990 Bellows 210/695. M. A. Burns & D. J. Graves, "Structural Studies of a Liquid-Fluidized Magnetically Stabilized Bed," 67 Chem. Eng'g Comm. 315 (1988). P. Knight, "Refining Recombinant Products with Chromatography," 6 Bio/Tech. 726 (1988). C. H. Lochmuller et al., "Fluidized-Bed Separators Reviewed: A Low Pressure Drop Approach to Column Chromatography," 1(1) Preparative Chrom. 93 (1988). C. H. Lochmuller & L. S. Wigman, "Affinity Separations in Magnetically Stabilized Fluidized Beds: Synthesis and Performance of Packing Materials," 22(11) Sepa. Sci. & Tech. 2111 (1987). M. A. Burns & D. J. Graves, "The Magnetically Stabilized Fluidized Bed as a Biochemical Processing Tool," 501 Annals N.Y. Acad. Sci. 103 (1987). T. Hu & J. Wu, "Study on the Characteristics of a Biological Fluidized Bed in a Magnetic Field," 65 Chem. Eng'g Res. Des. 238 (May 1987). J. Kohler & J. J. Kirkland, "Improved Silica-Based Column Packings for High-Performance Liquid Chromatography," 385 J. Chrom. 125 (1987). C. H. Lochmuller & L. S. Wigman, "Aerosel-Jet Produced, Magnetic Carrageenan-Gel Particles: A New Affinity Chromatography Matrix," 40 J. Chem. Tech. Biotech. 33 (1987). J. Kohler et al., "Comprehensive Characterization of Some Silica-Based Stationary Phases for High-Performance Liquid Chromatography," 352 J. Chrom. 275 (1986). K. D. Lork et al., "Role of the Functional Group in n-Octyldimethylsilanes in the Synthesis of C.sub.8 Reversed-Phase Silica Packings for High-Performance Liquid Chromatography," 352 J. Chrom. 199 (1986). C. D. Scott, "Techniques for Producing Monodispersed Biocatalyst Beads for Use in Columnar Bioreactors," Oak Ridge National Lab. manuscript (1985). M. A. Burns & D. J. Graves, "Continuous Affinity Chromatography Using a Magnetically Stabilized Fluidized Bed," 1(2) Biotech. Progress 95 (Jun. 1985). M. A. Burns et al., "Dried Calcium Alginate/Magnetite Spheres: A New Support for Chromatographic Separations and Enzyme Immobilization," 27 Biotech. & Bioeng'g 137 (1985). R. E. Rosensweig et al., "Magnetically Stabilized Fluidized Solids," 77(205) A.I. Ch. E. Sympo. Series 8 (1981). R. E. Rosensweig, "Fluidization: Hydrodynamic Stabilization with a Magnetic Field," 204 Science 57 (Apr. 1979). K. Unger & B. Scharft, "Controlled Porosity Silica Supports from Hydrolytic Polycondensation Reaction of Poly(ethoxysiloxane)," 55(2) J. Colloid. & Interface Sci. 377 (May, 1976). This invention was made with government support under grants awarded by the National Science Foundation. The United States government has certain rights in this invention. Primary Examiner: Silverman; Stanley S.
Assistant Examiner: Nessler; Cynthia L.
1. A method of conducting chromatographic separations of multi-component systems comprising contacting a multi-component system contained in a liquid carrier fluid with a solid support contained in a magnetically stabilized, fluidized support bed, wherein the solid support comprises a plurality of generally spherical beads having a generally central magnetic core and a surrounding exterior coating about the core comprising a porous silica or silica derivative, said magnetic core having a coefficient of expansion similar to or less that than the coefficient of expansion of said porous silica or silica derivative. 2. The method of claim 1 wherein the central core of the generally spherical beads is comprised of an impervious paramagnetic or superparamagnetic material. 3. The method of claim 1 wherein the central core of the generally spherical beads is comprised of an alloy of nickel and iron or an alloy of nickel and cobalt. 4. The method of claim 1 wherein the generally spherical beads further comprise an intermediate, non-porous coating comprised essentially of silica, gold or other protectively material. 5. The method of claim 1 wherein the exterior coating of the generally spherical beads further comprises a binding ligand capable of binding with one or more of the components of the multi-component system. 6. The method of claim 1 wherein the generally spherical beads have a diameter of about 10-250 .mu.m. 7. The method of claim 1 wherein the exterior coating of the generally spherical beads is less than 10 82 m thick. 8. The method of claim 1 wherein the chromatographic technique used is affinity chromatography. 9. The method of claim 1 wherein the chromatographic technique used is ion exchange, normal mode, or reverse phase chromatography. 10. The method of claim 1 wherein the thickness of the exterior coating of the generally spherical beads is chosen to maximize the efficiency of the chromatographic technique. 11. The method of claim 1 wherein the pressure drop across the support bed is less than 1 psi/cm length. 12. The method of claim 1 further comprising adding support material to the top of the bed, moving the support material downwardly through the bed, and removing the support material from the bottom of the bed. 13. The method of claim 12 further comprising stripping or desorbing any components that have become bound to the support material after the support material is removed from the bed. 14. The method of claim 1 wherein the exterior coating is comprised of a plurality of like monolayers of like inorganic microparticles consisting essentially of silica irreversibly joined to and surrounding said central core, each of said monolayers having a thickness of one microparticle. 15. The method of claim 14 wherein the size of the microparticles is chosen to optimize the size of pores formed in the exterior coating. 16. The method of claim 14 wherein the central core includes an oxide layer on its surface that facilitates the joining of the core to the exterior coating. 17. A method of conducting High Performance Liquid Chromatography comprising contacting a multi-component liquid solution to be separated with a solid support contained in a magnetically stabilized, fluidized support bed, wherein the solid support comprises a plurality of generally spherical beads having a generally central magnetic core and a surrounding exterior coating about the core comprising a porous silica or silica derivative, said magnetic core having a coefficient of expansion similar to or less than the coefficient of expansion of said porous silica or silica derivative. 18. The method of claim 17 wherein the generally spherical beads are pellicular beads. 19. The method of claim 17 wherein the central core is comprised of an impervious paramagnetic or superparamagnetic material. 20. The method of claim 17 wherein the central core is comprised of an alloy of nickel and iron or an alloy of nickel and cobalt. 21. The method of claim 17 wherein the generally spherical beads further comprise an intermediate, non-porous coating comprised essentially of silica, gold, or other protective material. 22. The method of claim 17 wherein the exterior coating further comprises a binding ligand capable of binding with one or more components to be separated from said solution. 23. The method of claim 17 wherein the generally spherical beads have a diameter of about 10-250 .mu.m. 24. The method of claim 17 wherein the exterior coating of the generally spherical beads is less than 10 .mu.m thick. 25. The method of claim 17 wherein the exterior coating is comprised of a plurality of like monolayers of like inorganic microparticles consisting essentially of silica irreversibly joined to and surrounding the central core, each of the monolayers having a thickness of one microparticle. 26. The method of claim 17 further comprising adding support material to the top of the bed, moving the support material downwardly through the bed, and removing the support material from the bottom of the bed. 27. The method of claim 26 further comprising stripping or desorbing any components that have become bound to the support material after the support material is removed from the bed. more of the components of the multi-component system wherein the magnetic core is comprised of a material having a coefficient of expansion similar to or less than the coefficient of expansion of said porous silica or silica derivative. This invention relates to an improved support material for use in chromatography. More particularly, it relates to a magnetic support material usable for high performance liquid chromatography operated in a magnetically stabilized fluidized bed. In recent years, there has been a growing awareness of separation costs as a part of the total cost in chemical processes. The biochemical separation processes currently used for enzyme and protein purification present further difficulties. At present, they are almost without exception highly labor-intensive, slow, and relatively non-selective. A typical separation would involve gel filtration, ion exchange, or selective adsorption in chromatography columns. The fragile beads used in such columns impose pressure drop limits of 1 psi or less with correspondingly low flow rates. Another common but awkward step involves fractional precipitation of proteins followed by centrifugation and decantation. Separations based on electrical charge such as electrophoresis and isoelectric focusing offer relatively convenient ways of obtaining purified compounds at the laboratory level, but pose problems of scale up. These problems arise because the heat produced by the passage of electric current increases as the square of a dimension (i.e. as the cross section) while the surface area for heat removal goes up only linearly. Convection, band spreading, etc. also increase at high rates with increasing scale. Normally, one must stop the process and stain for proteins to see how far the separation has progressed. Attempts have been previously made to save some of the manual labor usually associated with such operations by arranging bio-separation units into a continuous processing train. Some of the units are inherently batch oriented, however, and these attempts serve only to enforce the notion that new purification techniques are needed. Among the many techniques used today in biochemical separations, perhaps the most efficient and selective is one called affinity chromatography (AC). Unlike the other separation techniques mentioned, which have typical purification factors P.sub.f (=product purity/feed purity) of 2 to 10, affinity separations in favorable cases achieve P.sub.f values of 10,000 in a single step. Further, unlike other techniques, AC does not rely on general molecular properties such as size, electrical charge, or density to carry out a separation. Instead, it involves a very specific interaction between two biomolecules, one of which is chemically attached to a solid support phase and the other of which is dissolved in solution (usually aqueous). Such interactions are almost a universal feature of biomolecules. Specific examples would include binding between antibodies and antigens, hormones and receptors, enzymes and either substrates, coenzymes, inhibitors, or activators, DNA and its complement (a repressor or catabolite gene activator protein for double-stranded DNA or the complement of a single strand of DNA) and messenger RNA and ribosomes. The beauty of such biochemical pairing is that since it involves a number of simultaneous interactions between amino acid or nucleotide residues, it can be highly specific. Biomolecules typically perform their functions in the presence of thousands of different types of molecules, indicating that this specificity is both a necessary and a natural part of their character. Affinity chromatography is a broad term that involves everything from a weak interaction, which simply retards one molecule's passage through a column, to a strong, almost nonreversible binding to the column packing. The latter would more properly be termed a bio-specific adsorption-desorption cycle. Drastic changes in pH, ionic strength, or temperature, or the addition of a competing soluble molecule are needed in such a case to release the molecule from its complement on the solid phase. This strong binding system could be operated in a batch vessel in an adsorption-desorption mode, but in most cases a column is used whether or not it is needed. Since other molecules are not usually affected by passage through the affinity column, several columns in series can be used to recover several molecules of interest from a given fermentation broth. The cost of such high specificity is a requirement for a new solid support for each product to be isolated. These chromatographic supports are the most expensive single component of the technique. Despite the advantages over other bioseparation schemes, normal affinity chromatography still has several serious disadvantages: (1) Even when operated as a column, it is a discontinuous chromatographic or adsorption-desorption process characterized by the introduction of a "pulse" of material and the recovery of a usually diluted "pulse" of product. The disadvantage of this type of operation is that the size of the sample is severely limited. Most of the time that the column is in operation, no product is being collected, leading to an inefficient system. (2) One cannot, in such a column, use the viscous, debris-laden suspension of broken cells from a fermentation that one might hope to. A packed column would almost immediately plug if subjected to such a mixture. The removal of debris and DNA (whose extremely high molecular weight has a large effect on viscosity) is still a serious problem in industrial-scale processes. (3) Since peak emergence from the column is related to time, control and automation of the process is more difficult than it is for a steady-state operation. 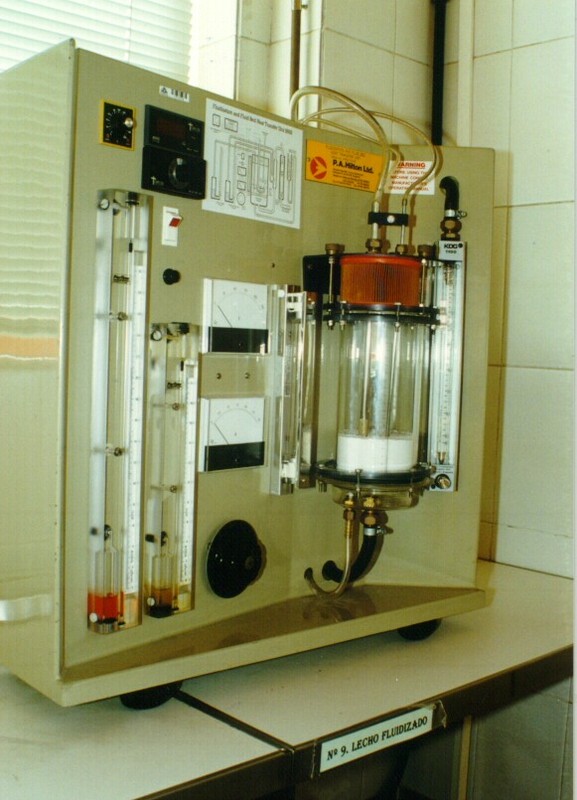 Recognizing these shortfalls, attempts were made to overcome these problems by devising various types of continuous chromatographic techniques. The aim wa to eliminate the inefficiency of a batch operation by allowing the sample to be injected continuously, and the products to be continuously withdrawn. These techniques utilized a moving chromatographic bed wherein the movement (or in some cases a simulated movement) is either perpendicular to the solvent flow, allowing a number of different compounds to be purified simultaneously, or countercurrent to the flow, in which case usually only two pure components are obtained. The advantage of either variation is the relatively high throughput that can be obtained compared to repeated batch operations. The disadvantage of some of these techniques, such as the simulated moving bed, is that they require elaborate and expensive mechanical moving seals or automatic valves to operate. In addition to the added expense, the risk of contamination is high when the system is one involving biomaterials, and when it is operated over long periods of time. Also, the problem of clogging by debris is not eliminated by any of these continuous systems when they only simulate bed motion. In addition to affinity chromatography, there exist several chromatographic techniques or "modes" such as normal phase, reversed-phase, hydrophobic interaction, ion-exchange, and size exclusion. The generic term chromatography refers to a separation process based on differential adsorption of individual components of a flowing feed mixture on a solid support such that different products emerge from a tube filled with an appropriate support at different rates. The varieties of chromatographic modes differ in the physical basis on which they accomplish the separation. The other chromatographic modes cannot achieve the specificity of affinity interactions but, in exchange, offer a much more practical advantage--flexibility. Because these techniques rely on a product's tendency to partition unequally between two unlike phases, the same solid support can be used for many different separations with only the more readily modified mobile phase liquid composition adjusted to make the solid and liquid phases more or less distinct. High Performance Liquid Chromatography (HPLC) has emerged as one of the dominant procedures used for bioseparations today. All of the chromatographic modes described above have been demonstrated in the HPLC system, which achieves extremely high separation efficiencies by employing small (5-50 .mu.m), porous particles with high surface areas for adsorption. Because these small particles are packed into a fixed bed, however, very high pressure heads are required to move fluid through an HPLC column at a sufficient flowrate. High pressures have become such an accepted part of chromatographic dogma that the acronym HPLC is equally often translated High Pressure Liquid Chromatography as High Performance Liquid Chromatography. A recent development that can be used to advantage to eliminate or substantially reduce the problem of clogging while retaining the other advantages of continuous chromatography is the magnetically stabilized fluidized bed (MSFB). The ordinary fluidized bed has been used in industrial processing for many years, mostly with catalytic particles that tend to foul or become poisoned, or where thermal effects are important. The basis of such beds is that, above a certain critical fluid velocity, small particles of a solid become suspended in a high velocity stream and the solids suspension acts much like a fluid, permitting it to flow out of the reactor for regeneration or replacement. If the fluid velocity is increased above the critical fluidization value, however, undesirable effects such as bubbling and slugging occur. These cause bypassing of reactants through the bed and can result in particle entrainment in the gas. Although these problems are less severe in beds fluidized with liquids rather than with gases, the fluidized particles still undergo a strong back-mixing process so that the bed behaves much like a continuous flow stirred-tank reactor. While this turbulence may be desirable for certain processes such as heat exchange, it would be highly detrimental to any type of chromatographic separation. As early as 1961, Hershler experimented with magnetic fields applied to liquid metals and magnetically susceptible solids that had been fluidized. He reported in the patent literature (U.S. Pat. Nos. 3,219,318 and 3,439,899) that a magnetic field created with an alternating current could be used to stir such liquid metals, fluidize beds even in the absence of a supporting gas or liquid stream, and (with several isolated fields in a column) decrease the bubbling and prevent material from being ejected from the top of a fluidized bed. Other work on magnetic fields in conjunction with fluidized beds was carried out by Tuthill (U.S. Pat. No. 3,440,731). It was not until the late 1970's, however, when Rosensweig began publishing in this area that careful and systematic study of magnetically stabilized fluidized beds began ("Magnetic Stabilization of the State of Uniform Fluidization," 18 Ind. & Eng'g Chem. Fundamentals 260 (Aug. 1979); "Fluidization: Hydrodynamic Stabilization With A Magnetic Field," 204 Science 57 (April 1979); and with Siegell, Lee, and Mikus, "Magnetically Stabilized Fluidized Solids," 77(205) A.I.Ch.E. Synpo. Series 8 (1981)). Rosensweig and his co-workers made several important findings. First, fluidization of magnetically susceptible solids can be stabilized in a uniform gradientless magnetic field in which the individual particles experience no net force. An axially-oriented field is preferred, although the orientation of the field is not crucial. Second, stabilization is observed over a wide range of field strengths and fluidization velocities, and the applicable ranges of the important variables have now been mapped out by Rosensweig. For most fluid velocities, when the bed is stabilized, a decrease in magnetic field strength will result in normal fluidization, while an increase will result in agglomeration of the solid particles. The effect of the magnetic field can be viewed roughly as creating a magnetic dipole in each particle that causes it to become "sticky" in a direction parallel to the field lines. This produces what amounts to chains of beads parallel to the axis of the bed. The MSFB has properties that are almost an ideal combination of those exhibited by the fixed bed and the fluidized bed. Like the fixed bed, the MSFB permits fluid flow through it with essentially no backmixing. Therefore, the fluid phase can be efficiently contacted with a solid bed of adsorbent. With a long enough bed, the liquid theoretically could have solute removed down to a level that is in equilibrium with the solid phase entering the top of the bed. Like the fluidized bed, the MSFB exhibits low pressure drop and the ability to have solids flow smoothly through the system under the influence of gravity, so that they can be removed at the bottom and regenerated for re-use. Clogging by debris is controllable, because the bed contents, along with debris that they filter out, can be continually removed and replaced. Unlike either system, however, the MSFB can create a continuous countercurrent contact of solids and liquid with almost perfect plug flow of the solids. The utility of countercurrent contact is analagous to the thousands of distillation towers now in use in petroleum and other industries that are dependent on countercurrent flow of a liquid and a vapor. It would be very advantageous if chromatographic operations carried out in an MSFB could achieve high performance without the high pressure. The fixed solids geometry and lack of backmixing achieved in an MSFB are a crucial development required for successful elution chromatography under the low pressure conditions of a fluidized bed. Furthermore, the ability to move the solid as well as liquid phases in an MSFB allows truly continuous, countercurrent operation not feasible in a conventional, fixed-bed HPLC. Especially for process scale separations, high production rates are a critical design consideration. Continuous operation makes it possible to achieve required throughputs with slower flowrates that could allow more complete equilibration between the fluid and solid phases. The development of such a novel bioseparation process, however, depends on the availability of a solid phase support material appropriate for use in the MSFB. The major properties required are magnetic susceptibility to facilitate stabilization, high surface area for maximal adsorption, well-defined and reproducible surface characteristics, small particle size for improved transport characteristics, and high density to prevent particle elutriation at higher flowrates. Presently, only one type of support material is available for use in MSFB bioseparations, the dried calcium alginate/magnetite (CAM) beads described in U.S. Pat. No. 4,675,113 (Graves et al.). (An analogous support, which substitutes K-carragenan for alginic acid, was also recently reported. Lochmuller & Wigman, "Aerosol-jet Produced, Magnetic Carrageenan-gel Particles: a New Affinity Chromatography Matrix," 40 J. Chem. Tech. Biotech. 33 (1987).) Although appropriate for the affinity system previously demonstrated, these beads are too large (300-900 .mu.m) and have too little accessible surface area for protein separations based on non-specific modes of chromatography. To achieve the system flexibility, it is necessary to use a porous material that is readily derivatized to generate surfaces known to be chromatographically effective and large in area. A number of techniques have been reported for reducing the size of extruded supports of this type. These include vibration of the extrusion needle to induce Rayleigh instabilities in the viscous extruded stream, and aiming a jet of air at the needle tip. The former technique, which involves costly transducers, has been shown to be limited to a 600 .mu.m minimum diameter (translating to 185 .mu.m when dried). Although this represents an improvement over the original dried CAM beads, commercial HPLC supports range in size from 5-75 .mu.m. The air jet technique, while capable of producing droplets as small as 40 .mu.m (12 .mu.m dry), is unacceptable on the basis of the significant waste of raw materials in isolating the desired size fraction because of the accompanying particle size distribution of 40-600 .mu.m. Further, the resulting particle size distribution is also highly sensitive to the exact alignment of the gel and air outlets, making reproducibility questionable. On the other hand, conventional chromatographic supports are predominantly silica-based. Surface preparation generally involves attachment of silanes to the silanol-rich silica by wellstudied techniques that are easily found in the literature. Silanes are organosilicon compounds that feature a readily bondable silicon head group and a wide variety of organic tails that can provide the desired normal phase, reversed phase, hydrophobic or ion exchange surfaces desired for whichever chromatographic mode is to be used. Unfortunately, silica itself is not magnetically susceptible and, therefore, is not directly usable in an MSFB. Accordingly, there exists a need for a support material, usable in an MSFB, that is of suitably small size for use in HPLC while avoiding the use of high pressure. The support should also involve a porous material that is readily derivatized to generate surfaces known to be chromatographically effective. The present invention meets the need for a support material that is usable in an MSFB and that is of suitably small size for use in preparative HPLC. The present invention involves using beads having a magnetic and impervious core surrounded by a coating of porous silica that can be bound with various binding ligands. The magnetic core enables the beads to be used to advantage in an MSFB while the silica derivative coating enables a wide variety of chromatographic techniques to be used in order to separate out a variety of components from a multi-component system. Use of such beads in an MSFB used for HPLC results in efficient separation at very low pressure drops in comparison to normal HPLC methods. Accordingly, it is an object of the present invention to disclose a novel magnetic chromatographic separation support material. It is a further object of the present invention to disclose the use of a novel magnetic support material in HPLC of bioproducts and other multi-component systems. It is still a further object of the present invention to disclose HPLC of bioproducts carried out in a magnetically stabilized fluidized bed. The following description and examples are presented in order to allow for a more thorough understanding of the subject matter and experimental procedure of the present invention. The examples are meant to illustrate the embodiments of the present invention, and are not to be construed as limiting the scope of the invention. In 1969, a particular support structure called the pellicular bead was first described by Horvath and Lipsky, "Column Design In High Pressure Liquid Chromatography," 7 J. Chroma. Science 109 (Feb. 1969). The pellicular support concept utilizes an impermeable core coated with only a thin, porous active layer. The structure was originally proposed in order to minimize diffusion limitation in the large (75 .mu.m) totally porous supports available at that time. Presently, however, in conventional HPLC, the pellicular bead has now largely given way to newer, small (5-10 .mu.m) totally porous supports. The present invention involves using the now-disfavored pellicular bead structure in an MSFB/HPLC system. Use of a pellicular bead structure in such a system provides two advantages: the enhanced transport characteristics of a pellicular bead can be utilized and, in addition, a magnetic material can be used as the impermeable core, thereby reaping the benefits of an MSFB. The porous surface coating is comprised essentially of silica, which allows the attachment of a wide variety of silanes by well-known techniques and, thereby, enables their use in a wide variety of chromatographic techniques. Any variety of magnetically stabilized fluidized bed chromatography systems can be used in conjunction with the method of the present invention. The number of these alternative forms may be found in the prior art as, for example, U.S. Pat. No. 4,283,204 (Savage), U.S. Pat. No. 4,272,893 (Levenspiel et al. ), U.S. Pat. No. 4,261,109 (Mikus et al. ), U.S. Pat. No. 4,247,987 (Coulaglou et al. ), and U.S. Pat. No. 4,115,927 (Rosensweig). Typically, in operation, solid chromatographic support materials according to the present invention are introduced into a column bed, often in a small amount of solvent stream. A feed stream containing the crude bioproduct or other multi-component system to be separated enters the column at either end, but preferably at the bottom. Any standard means can be used for removing the solids from the bottom of the column and they can then be further treated to elute the bound biomaterial or separated component and can thereafter be recirculated if desired. A simple embodiment of the apparatus of the present invention would involve a single column adsorbing and stripping off one component from the feed stream. It is clear, however, that any variety of such columns can be combined in series or otherwise to consecutively strip off and/or desorb various components. Another alternative would be to adsorb several components in a primary column and then desorb each of those components separately. The core material can be just about any magnetic metal or magnetic metal oxide. Preferably, however, the material used will demonstrate magnetic properties when placed in a magnetic field but will avoid becoming permanently magnetic. Support materials that retain a permanent magnetism may cause problems of agglomeration upon removal from the MSFB. It may be advantageous to use a paramagnetic or super-paramagnetic material in manufacturing the cores. In general, the magnetic materials used will have a higher density than the silica material used in normal HPLC. A further advantage of the beads of the present invention is that their density can be changed independently of their porosity. The example of the preparation of a support material in accordance with the present invention discussed below is intended merely as a single embodiment of the present invention and should not be considered to limit the scope thereof. Those of ordinary skill in the art will recognize that a wide variety of magnetic materials can be substituted for the nickel of the disclosed embodiment without departing from the scope of the present invention. A nickel/silica composite support can be produced by an electrostatic layering technique first discussed in R. K. Iler, "Multilayers of Colloidal Particles," 21 J. Colloid. & Interface Sci. 569 (1966), and put into commercial practice as disclosed in U.S. Pat. No. 3,505,785 (Kirkland), in the development of Du Pont's Zipax.TM. pellicular support, both of which references are incorporated herein. The silica and polymer treatments can be continued in alternate steps to produce any desired number of layers. The number of layers would optimally be chosen to maximize the use of the transport characteristics of the porous silica as a chromatographic support material. The pores formed as the colloidal silica microparticles are deposited on the surface of the bead particles would be of the same order of magnitude as the silica microparticle size. Therefore, the desired pore size can be controlled by proper selection of the colloidal silica, which is typically commercially available from 10-100 nm. For use in an MSFB, there is a trade-off between the weight of the prepared macroparticle beads and the effective distance that a molecule to be separated must penetrate. If the beads are too small (approximately less than 5 .mu.m), the liquid phase will wash the particles out of the column if operated at any usable flow rate. If they are too large, the interior of the bead is not effectively used. Thus, since a minimum diameter/weight is required for adequate penetration, the method of the present invention makes use of pellicular bead technology to achieve a thin active layer while maintaining a large enough size to retain the material in the column. It is preferred that the macroparticle beads be approximately 10-250 .mu.m in diameter. The coating on these beads would typically be a very small fraction of the overall bead diameter, less than 10 .mu.m and preferably less than about 3 .mu.m. The thickness of the coating is determined by the efficiency of diffusion. Beyond a certain thickness, the inner portion of the coating will be underutilized. In preparing the coating, the number of silica layers laid down will generally range up to approximately 100, depending upon the size of the colloidal silica microparticles being used. Once the desired number of layers is obtained, the beads are heated to a temperature sufficient to burn out the polymer and partially sinter the silica. When the polymer is burned off by heating, a chemical reaction is generated between the various silica layers that overcomes the initial electrostatic repulsion that had prohibited direct layering of silica to silica. This step must be performed carefully, however, to prevent oxidation of the underlying nickel and accompanying breakage of the silica coating as the underlying porous nickel oxide grows outward from the original silica/nickel interface. A temperature of approximately 400.degree. C. in air appears to efficiently remove the polymer without significant nickel oxidation. The sintering step can then be carried out in vacuum or in inert atmosphere at higher temperatures. One problem that may be encountered when heating the silica/polymer coating to burn out the polymer and sinter the silica is that the magnetic core may expand at a faster rate causing cracks in the silica coating. Thus, it is preferable to use a core material having a low coefficient of expansion or one with a coefficient of expansion similar to that of the silica coating. One promising material is Invar.TM. (International Nickel Company), an alloy of nickel and iron or cobalt. As an alternative, the nickel particle can be protected from oxidation and other chemical attack by laying down a layer of, for example, gold before coating with silica. Once the magnetic core/silica composite macroparticle support has been prepared, it can be readily derivatized by the attachment of silane binding ligands using wide variety of well-studied studied techniques known to those of ordinary skill in the art. An example of such techniques is disclosed in U.S. Pat. No. 3,722,181 (Kirkland et al.). Such silanes will feature a wide variety of organic tails that than can be used with various chromatographic modes. In a particular example, 20-45 .mu.m nickel particles were used as the core material. The use of such a dense metal serves a secondary function, that of a dense ballast. This density increases the terminal velocity of the particles in an MSFB and, thereby, extends the useful range of flow velocities in such an MSFB. In such a manner, adsorption surface area is maximized without bed instability or particle elutriation. It should be noted that, while the specific disclosure given above discusses the layering of silica onto the magnetic core using a method of alternating silica layers with polymer layers followed by a burning off of the polymer material, any method of depositing suitable thicknesses of silica can be used. As an alternative example, Unger and Scharf have disclosed a method of beginning with a soluble silica material that is polymerized onto a surface using an organic filler emulsion that subsequently will evaporate off. This method avoids the heat treatment step but also lacks the ability to control the pore size as precisely as the Du Pont technique. K. Unger & B. Scharf, "Controlled Porosity Silica Supports From Hydrolytic Polycondensation Reaction of Poly(ethoxysiloxane)," 55(2) J. Colloid. & Interface Sci. 377 (May, 1976). While the primary ingredients of the beads of the present invention are the magnetic core and the silica derivative outer coating, several other aspects may be important. It is known to those of skill in the art that a molecular layer of metal oxide is required on the surface of the core material in order to bind with the silica of the coating. Virtually all magnetic materials will naturally encompass a surface layer of oxide and thus would be suitable core materials. In addition, it is preferable to provide an intermediate coating of a non-porous silica, or other material such as gold, between the core material and the silica derivative outer coating. Such a non-porous intermediate coating protects the components being separated from possible contamination by the metal of the magnetic core during their diffusion into the silica derivative outer coating. Such an intermediate layer also minimizes oxidation problems that can lead to cracking during the polymer burn-off step of bead production. An intermediate coating of non-porous silica or other material can be deposited by any appropriate method as a pretreatment step to the forming of the porous outer coating. One example of a method of laying down such an intermediate coating is set forth in U.S. Pat. No. 2,885,366 (Iler), incorporated herein by reference. Thus, one preferred embodiment of the support material to be used with the method and apparatus of the present invention is one having an Invar.TM. core with an oxide surface surrounded by a non-porous silica or gold coating and further surrounded by a porous silica coating coupled with a silane having an appropriate bonding ligand. High Surface Area--as compared to the dried calcium alginate beads of the prior art, the beads of the present disclosure have a substantially improved surface area to volume ratio. Controllable Surface Area and Pore Size--the ability to coat the magnetic core with a specifically chosen number of silica layers of a specifically chosen colloidal silica size enables the surface area of the beads to be much more accurately controlled. Further, by choice of the colloidal silica size, the pore size of the resulting coating can also be accurately controlled. The pore size will roughly correlate to the size of the colloidal silica chosen as will the thickness of each layer. Bead Size--as stated, the beads of the present invention can be produced in any size. By contrast, the calcium alginate beads of the prior art are relatively large and, therefore, are not as efficient. On the other hand, while the beads currently used in normal HPLC techniques can be very small, normal HPLC can not be run on a continuous basis. Further, the small bead size of the normal packed HPLC column leads to a significant pressure differential across the column, typically approaching 2,000 psi per 20 cm of length. Use of an MSFB, however, leads to a very significant reduction in pressure drop across the column. The method of the present invention can be operated with pressure drops of only 0.1-10 psi, typically less than 1 psi/cm. The pressure required in the present invention is roughly equal to the pressure needed to support the weight of the solid material and thereby fluidize the bed. Efficiency--the use of an MSFB also allows for a continuous process whereby a feed stream to be separated, as well as a stream of solid support material can both be continuously fed to the HPLC column and support material bound with the component to be separated can be continuously removed from the other end of the column for further processing. At the present time, it has been seen that the method of the present invention can achieve an efficiency of up to 6,000 plates/meter. It is anticipated that the efficiency can be significantly increased with further study. Thus, while the method of the present invention may not be as efficient on a per length basis as normal HPLC (due to the larger size of the support material beads and the increased void volume in a fluidized bed as compared to a packed bed), the present invention overcomes the inherent inefficiency of the batch process required with normal HPLC. While various embodiments of the present invention have been illustrated and described, it is to be understood that this invention is capable of variation and modification and is not to be limited except to the scope of the appended claims.